While WKU’s Dr. Bruce Schulte has conducted research on a variety of animals including the North American beaver and the Florida manatee, his current international research on African elephants is positively impacting village communities in Kenya by helping to reduce human-wildlife conflict. 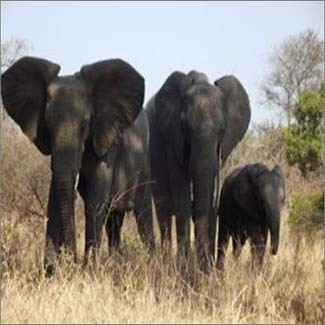 Schulte’s research on African elephants focuses on their behavioral patterns. He studies how chemical communication affects elephant populations and how it can be used to reduce negative interactions between human populations and elephants. Schulte explained that elephant populations have been in conflict with human populations for years, mainly due to habitat destruction throughout their range. What the elephants may consider a meal, however, is the livelihood of subsistence farmers in Kenya. Schulte’s research aims to use chemical signaling to resolve this tension. By applying a chemical signal to which elephants react negatively, scientists can repel elephant populations away from crop fields. Elephants can quickly adapt to negative signals of one modality, such as a scent, so Schulte and other scientists are working toward developing a more comprehensive solution. In addition to deterring elephant populations from crop fields, Schulte also hopes to redirect the animals with positive signaling in a “push-pull” fashion. Because elephants are migratory animals, this methodology may be important in helping the animals navigate their highly fragmented habitat. Schulte is partnered with Earthwatch Institute, a citizen science organization that pairs together scientists and volunteers to perform research worldwide. This specific project on human-elephant conflict and climate smart agriculture follows up on his previous work in Tanzania and on a recent collaboration with Dr. Michael Stokes (WKU Biology), Dr. Mark Cambron (WKU Engineering) and former biology graduate student Simon Kasaine, now employed by Wildlife Works in the Tsavo National Park region of Kenya. Schulte also led a study abroad course to South Africa this summer. The animal behavior and research courses allowed students the immersive experience of going out into the South African wild each day in safari vehicles to observe and cover the major principles of animal behavior. With the help of a tracking guide, students learned to track wildlife by identifying prints or calls. Schulte has been conducting research on elephants and rhinos in South Africa for over a decade. Schulte continues to expand his elephant behavior research with a new project in Zambia in collaboration with African Lion & Environmental Research Trust just beginning. He is actively looking for WKU undergraduate students and prospective graduate students to become involved in this new study and his ongoing projects.